At the Laurel Oaks Fall Fest in Wilmington on Saturday, wearing similar outfits and similar zombie makeup, these three Lynchburg-Clay students who attend Laurel Oaks Career Campus pose for a photo at the Laurel Oaks Fall Fest in Wilmington. The event also included a trunk-or-treat, free hot dogs, pumpkin chucking, and health screenings administered by zombies. 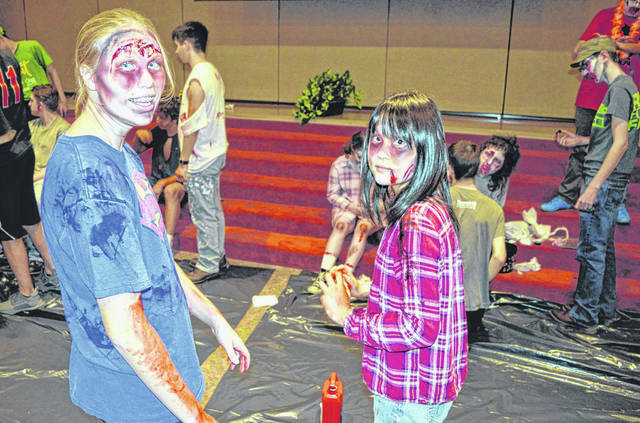 https://www.timesgazette.com/wp-content/uploads/sites/33/2018/10/web1_Zombie-pic.jpgAt the Laurel Oaks Fall Fest in Wilmington on Saturday, wearing similar outfits and similar zombie makeup, these three Lynchburg-Clay students who attend Laurel Oaks Career Campus pose for a photo at the Laurel Oaks Fall Fest in Wilmington. The event also included a trunk-or-treat, free hot dogs, pumpkin chucking, and health screenings administered by zombies.